This data table lists Vandercook Models 0, 01, 03, and 099 only. Currently, there are 112 presses listed (though there are probably many more yet to be counted). 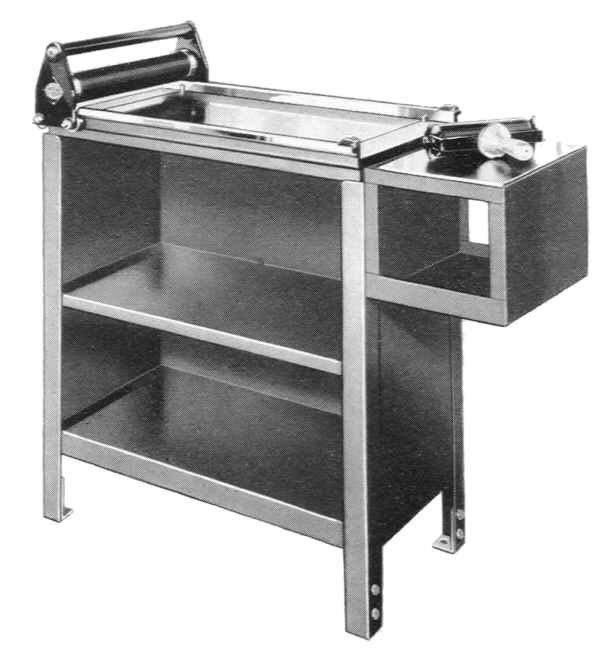 Often called sign, showcard, or gravity presses, these small proof presses differ from the larger models in that the impression cylinder rolls solely on the bearers, are not geared, and do not have an inking assembly nor a motor. These presses also have a separate serial number series. #0101 was the first office press manufactured in 1929 and #07952 was the first in 1957, after which production on these models ended. Because of their small size, there are still quite a few of these in letterpress shops. * The serial number is stamped into the bed bearer or in the case of the 099 on the bed. See also the main census for the larger geared-cylinder models, and the serial number tables. To add or correct data, use the Contact Form. Please provide the model name, serial number, owner/institution name and location. 0 07742 Tom Noyes USA MN ? *Other brands include Challenge, Nolan, Showcard, Sign Press, and Triumph in the US; and Cropper, Farley, Soldan, Stephenson Blake in the UK. The German manufacturer Wittekinde exported its Triumf presses to the US under the name Atlantic. I wish to thank everyone who has shared their Vandercook press data, but especially those individuals who made an extra effort to report multiple other Vandercooks of which they are aware: Nina Ardery, John Barrett, Don Black, Denise Brady, Alex Brooks, Terrence Chouinard, Duncan Dempster, Hans van Eijk, Eric Holub, Jonathan Jarvis, Richard Kegler, Val Lucas, Nicholas Kennedy, Gerald Lange, Val Lucas, Daniel Morris, Ray Nichols, Steve Robinson, Paul Romaine, Michael Russem, Sara Sauers, Beth Seat, Dave Seat, Harold E. Sterne, Bernie Vinzani, Rick von Holdt, Kristin Walker, Bill Whitley, Dan Wood, and of course Fritz Klinke. WP-Table Reloaded plugin by Tobias Bäthge.